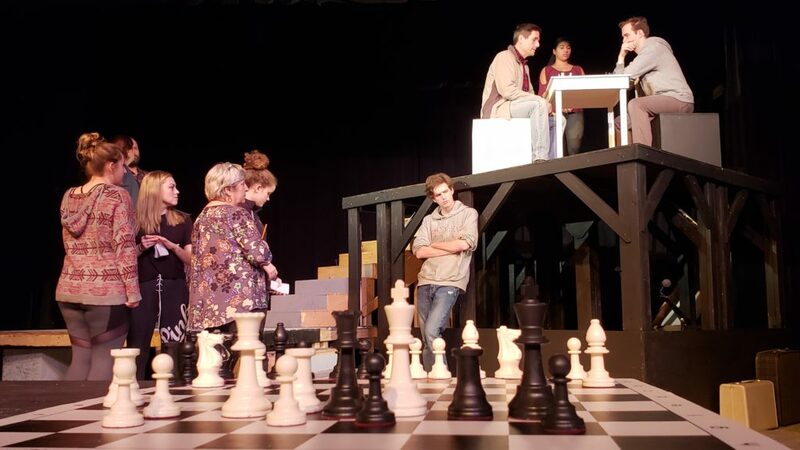 The Cold War, two superpowers, and an international chess championship sets the stage for Waterworks Players’ production of Chess. Inspired by the political machinations of the Bobby Fischer and Boris Spassky chess match, Chess tells a story of love and political intrigue in which Americans and Soviets attempt to manipulate an international championship for political ends. Chess is a rock musical based on the collaboration of Tim Rice, Tony Award-winning lyricist, and composers Benny Andersson and Björn Ulvaeus, members of the Swedish pop legend ABBA, and playwright Richard Nelson. Several numbers, including “One Night in Bangkok” and “I Know Him So Well”, are international hits. The principal characters of the show form a love triangle: the loutish American Grandmaster, the earnest Russian champion, and the Hungarian-American female chess second, who arrives at the international championships with the American but falls for the Russian. From Thailand to Hungary the players, lovers, politicians, CIA and KGB make their moves to the pulse of this monumental rock score. The story takes place in the year 1988. The cast includes Joe Reiff as the arrogant and temperamental American Freddie Trumper, and Jordan Whiley as the earnest Russian champion Anatoly Sergievsky. Jenni Reiff, playing Hungarian emigre Florence Vassy, is Freddie’s chess second, and the love interest at the peak of the love triangle and the center of the play. Mary Jo Stockton is Anatoly’s estranged wife, Svetlana, trotted out by the KGB to toy with Anatoly’s mind. Other characters include Anna Stinson as the Arbiter, the no-nonsense, authoritative chess tournament referee. Billy Tucker is Ivan Molokov, the scheming Russian chess second who may be playing a deeper game for the Soviets, assisted by Nikolai, played by Christian Huggard. Molokov’s American counterpart is Walter Anderson, played by Elijah Logue, who appears at first as merely a crass American capitalist but may be controlling some pawns of his own. Filling out the ensemble in a variety of roles are Kolby Grimsley Logue, Kristen Martwinski, Jeanne Strunk, John Diamond, Chloe Logue, and Barbara Wyrick. Don Blaheta directs this production of love, loyalty, and political intrigue. He is assisted by Katherine Lusk (music director), Ashley Jones (stage manager), Caitlin Mazura (production manager), A. Moffatt Evans (properties artisan and master carpenter), Hannah Boswell (costume designer), Scott Chapman (light designer), and Kaydan Ferguson (sound designer). It’s your move to get tickets for Waterworks Players’ production of Chess. Performances are at 8:00 pm on April 5, 6, 12 and 13. There is also a matinee at 2:00 pm on April 7. Tickets are $18. You can obtain tickets by visiting the Waterworks’ web site: http://waterworksplayers.org/buytickets or calling the box office at 434-392-3452. Chess is presented by special arrangement with SAMUEL FRENCH, INC.